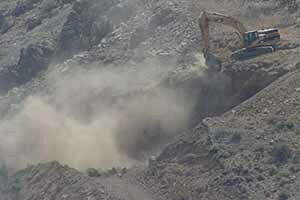 Comstock Mining Inc is hard at work putting toxic dust into our air. Compared to the other frustrations and annoyances we and our neighbors have been subjected to since the arrival of CMI, this is minor but it still leaves gaps. I started in January, working forward to catch up, and backward as I can find the time (I have a complete archive of correspondence and documents to draw from). 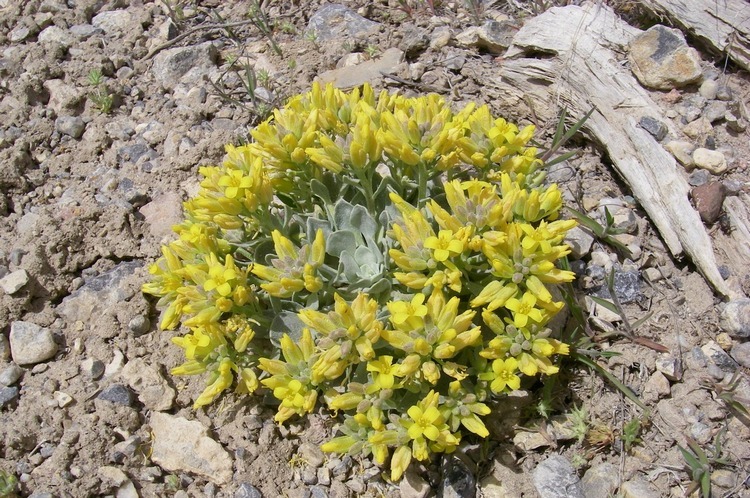 They are all collected here, including future additions, and also presented below, most recent at the top. 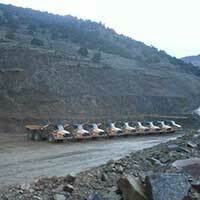 The Lucerne Pit created by Comstock Mining Inc.
CMI's Quarterly filings with the SEC reveal difficult financial picture. CRA and allied organizations rallied to call attention to human rights violations by CMI Director Daniel Kappes in Guatemala. 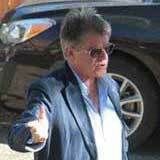 John V. Winfield came to our party and all he did was complain. Long hours on hard seats. 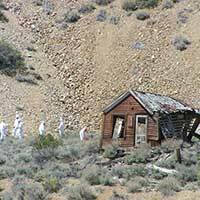 To protect ourselves, our neighbors and the Virginia City National Historic Landmark we have had to immerse ourselves in the processes of government. Ew. 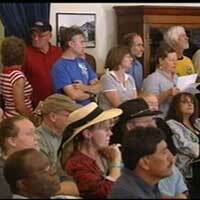 Storey County Commissioners can no longer shirk their responsibility. Ore trucks removed from the highway at last. 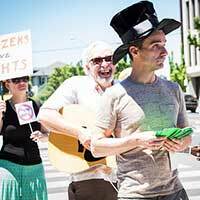 Further reading: A puff piece on Ron James; read the comments! 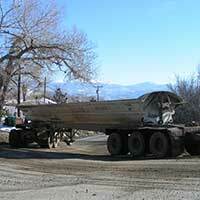 Quick notes from beyond the mountains: Who says there’s no excitement in Lovelock? Not only do people blissfully lock their love in the little park behind the Court House, they visit Temptations on MainStreet afterwards and have the best chocolate malt this side of Socorro’s in Mina.Temptations is a cosmopolitan presence in the old Lovelock downtown; it combines with the neighboring A Little Something to make up a micro-shopping district, and a pleasant break from the Interstate. Also worthy of attention: the new Visitors Center in the historic Lovelock Railroad Depot. This is the building where Edna Purviance bought her ticket and waited impatiently for the train that took her on to San Francisco and on to stardom in the movies! 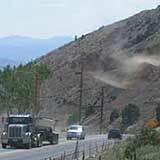 The California Trail Interpretive Center west of Elko has a new video.
. . . I can tell you where to get coffee in Battle Mountain at 4:30am: Bakker’s Brew, within a stone’s throw of the central freeway exit on Battle Mountain’s busy south side. That’s big, but what about this: Battle Mountain has a fern bar now. Okay, that’s stretching things, but Perdé, 453 N. 2nd Street on the north side of the railroad tracks, is a wine bar and art gallery, quite unlike anything we’ve seen previously in Battle Mountain. And the Cookhouse Museum, 905 Burns Street, will hold its annual sit-down barbecue dinner on September 14. The Museum, once the cookhouse at the 25 Ranch northwest of town, is open Tuesday-Saturday 10am – 4pm, and it’s an impressive building now put to effective use as exhibit and activity space . . . 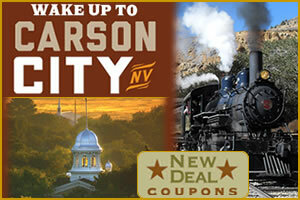 Anyone who visits Carson City can make use of these ‘New Deal’ coupons providing discounts on lodgings and other necessities and amenities . . .
We are gratified that the Carson City Convention & Visitors Bureau has renewed its sponsorship of The Nevada Travel Network. Jack Jacobs writes from the family farm in Carson Valley: “We picked 59 pints of Triple Crown blackberries today — they are delicious! Also, we received our first 48 jars (16 oz) of honey this week and are selling it for $8. This honey is from bees working at our berry farm. Let us know if you want honey in larger sizes as our bee keeper is holding 250 pounds and there is a price break for larger containers.” . . . At their last meeting the Storey County Commissioners approved a liquor license for the Virginia City Tourism Commission. If you think that’s strange, the Storey County School District has one too. Meet you in the Principal’s office for Happy Hour . . . Charlie B.’s Gallery in Fernleyis a hidden treasure for the art it contains, and Charlie is something of a treasure himself for his knowledge and involvement in the Nevada art world. Wally Cuchine buys art here, what else is there to say? Mancamp east of Winnemucca. Brrrr.
. . . 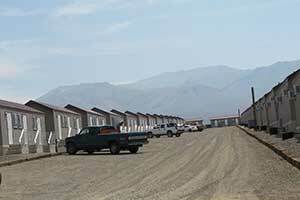 There is a chilling sight just east of Winnemucca: an enormous mancamp, about 400 brand new and mostly unoccupied dwellings, three to a unit, like a movie set for a science fiction story set sometime in the dystopian future. Oh, wait, it’s the present, and more acreage has been prepared with trailer hookups, one after another, still empty, along the length of these residential avenues. It’s in response to the expanded work force doing mining development and production work. Many of them live in local motels and RV Parks, occasionally in their cars, because the local housing inventory isn’t adequate to meet the demand . . .
Mankind’s oldest handiwork in North America. Eureka was saddened when the Keyhole bar closed down, but delighted that the historic Jackson House bar has opened again after nine years, with some thought to opening the restaurant, perhaps because the Chinese restaurant is also closed now. 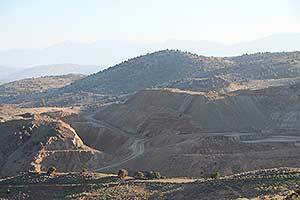 The closure that affects everything though, is the closing of the Ruby Hill Mine. The preliminaries are well underway, with complete shut-down due sometime in 2014. Some folks think that will be January 2.